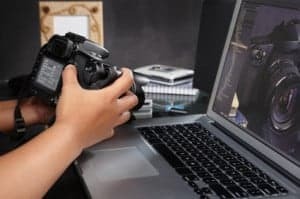 One member of our community, Sean Allen, sent in a question to me through our Facebook Fan Page, asking the difference between full frame and crop sensor DSLR cameras. Some of you may already know the answer to this question. If you do, please share your knowledge in a comment below. Welcome to the Full frame vs. crop frame DSLR camera debate! Back in the stone age when we all used film, 35mm became the gold standard film size. When we switched over to digital, there was no film to be used. On most DSLR cameras, the digital imaging sensor, which replaces film, is significantly smaller than 35mm film. In 2002, the first sensor that equaled the size of 35mm film was produced. Canon was the first mainstream camera manufacturer to produce a DSLR camera with a sensor the size of 35mm film. I can just imagine how the meeting went when the executives at the Canon marketing department sat down and tried to think of a way to make their new DSLR seem ultra-incredible and make everyone else's camera seem like it was half a camera. They accomplished this task by calling their 35mm equivalent sensor a “Full frame” DSLR camera, and decided to call all other DSLR cameras “Crop frame” cameras. The marketing worked. Many photographers feel like they have only half a camera unless they get the new, shiny “full frame” DSLR. The truth is that the “Full frame” sensors aren't “full” at all. It is an arbitrary size that was chosen at some point long in the past. Obviously, a much larger sensor could be produced. If this ever happens, I'm sure the marketing department at Canon or Nikon will have another meeting. The truth is that a more correct name for “full frame” would be “35mm equivalent sensor.” The correct name for a “crop frame” sensor would be “APS-C sized sensor.” Sometimes, politically correct photographers will refer to full frame and crop frame with these names, so they are handy to know. Full Frame Advantage #1: Low-light performance. Digital imaging sensors have tiny little light sensors that record light and produce a pixel. The tiny sensors are called photosites. Naturally, the larger the photosite, the more ability it has to capture weak light signals. Picture it like a satellite dish. Therefore, when all other factors are equal, a full frame sensor will always perform with less noise at high ISOs than “crop frame” DSLR cameras. Full Frame Advantage #2: Depth-of-Field. You may have noticed that although your point-and-shoot has an f/1.8 lens, it is nearly impossible to accomplish short depth-of-field on most point-and-shoots. The reason is that the sensor size affects apparent depth-of-field. Since a 35mm equivalent (full frame) sensor is larger, it can accomplish more shallow apparent depth of field than an APS-C sized (crop sensor) camera. Full Frame Advantage #3: Viewfinder Brightness. Because full frame cameras use larger lenses, they can produce a brighter viewfinder image. Very handy. Full Frame Advantage #4: Pro bodies. Unfortunately, both Canon and Nikon do not make DSLRs with all the bells-and-whistles in a crop sensor format. In my opinion, this is a shame. Still, it's the world we live in. Those who simply prefer a crop sensor camera cannot get all the same ultra high-end features available on the full frame bodies. Ugh! Full Frame Problem #1: Cost. Imaging sensors are cut out of large sheets of expensive chips called wafers. Since a full frame sensor is larger, only 20 sensors can be cut out of a standard-sized wafer. This, among other similar production costs, means that Full Frame DSLR cameras will always come at a premium. Full Frame Problem #2: Field of view. This is both a drawback and a benefit. Landscape photographers like full frame cameras because it makes all lenses seem like they are zoomed out more. You might think of crop sensor cameras as having a built-in zoom of 50 or 60%. This is a blog post all of itself to fully explain. Just know that SOME wildlife photographers choose a crop frame camera to get the extra zoom and landscape photographers almost universally prefer full frame, even though a crop frame camera can achieve the same wide angle of view by buying a wide angle lens built for a crop frame camera, like the fantastic Nikon 10-24mm. Just to be technically correct, the sensor size doesn't magnify the scene at all, it just restricts the field of view. Full Frame Problem #3: Weight. The sensor itself barely adds any weight to the DSLR, but it requires larger, heavier, and more expensive lenses. This means that the gear can be much more cumbersome and awkward to use. Full Frame Problem #4: Lens availability. Although full frame lenses will work properly on crop frame DSLRs, the reverse is not true. Therefore, crop sensor DSLR cameras have a greater variety of lenses available to them. On a Canon camera, you should know that a full frame EF lens will work on any EF-S crop sensor body; however, the reverse is not true. EF-S lenses do not work on full frame Canon bodies. In the Nikon system, both crop sensor DX lenses and full frame FX lenses will function on crop or full frame bodies; HOWEVER (and it's a big however), if you put a DX lens on a full frame body, you'll see that a significant portion of the edge of the frame is black. This is caused by the smaller DX lens not reflecting the image onto the full area of the full frame sensor. So in short, full frame cameras require full frame bodies. Crop sensor cameras can use either full frame or lenses for crop sensor cameras. The only difference between Canon and Nikon in this regard is that Canon's crop sensor lenses won't even mount on a full frame Canon, and the Nikon crop sensor lenses will mount just fine but the functionality is mostly useless.